AOL Users Report SPAM that IS NOT SPAM! Abuse Of AOL, Spam detection poison, The problem might be you. If you use AOL for your email PLEASE NEVER click the spam button to “clear” your INBOX! AOL reports your SPAM to the senders service provider! Due to our own ZERO SPAM Tolerance CompanyV subscribes to a FEEDBACK LOOP with AOL. We want to know if our customers are behaving badly! 99% of all of the complaints we receive from AOL are complaints about email an AOL subscriber has requested! 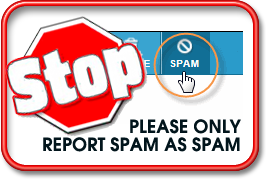 IF you subscribe to a newsletter and then report that newsletter as spam – we get a complaint – if we get too many complaints AOL can refuse to receive ANY EMAIL from ANY of our Mail Servers and ANY of our customers! Accidentally mark a message as Spam? If it’s been less than five days since you marked the message as Spam, you can still move it back to your inbox. After five days, your Spam folder will be automatically deleted. 1. In the left panel, click the Spam folder. 2. Click the box to the left of the message that you want to move out of the Spam folder, and then above your list of messages, click the OK NOT SPAM button. Voila! You’ll find the message back in your inbox filed under the original date you received it. ONLY report SPAM as SPAM! 1. Click the box to the left of the message that you want to mark as spam, and then above your list of messages, click the Spam button. That’s it! The message has been moved to your Spam folder, located in the left panel. If you request Account Information from a bank or an investment firm and they send you details either in the email or as an attachment and you report that email as SPAM – the entire contents of the email AND the attachment get sent from AOL to the service Provider. However AOL redacts the AOL users email address.